Coach Jim Todd with fellow medal-winners, Charlie Baldwin and Nancy Bell, from 360 Kickboxing Club in Ripley. Three golds were among a haul of medals won at the world championships by a proud kickboxing club based in Ripley. The independent 360 Club represented England at the Unified Championships, run by the World Traditional Kickboxing Association, in Carrara, Italy. And they did their country proud, returning home with nine medals, including world titles for coach Jim Todd, 14-year-old Charlie Baldwin and ten-year-old Nancy Bell. 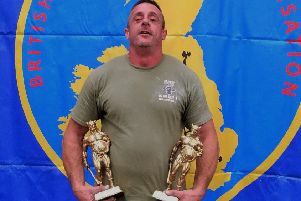 Todd, who has years of martial arts experience behind him, won gold in the under-74kg veteran points class, while Baldwin won the under-63kg points class and Bell triumphed in the team event for eight-to-12-year-old girls. Todd also won a bronze, Baldwin also won two silvers and two bronzes and Bell also won a silver, while a fourth team member, Louis Clark was ruled out by injury. Students at the club, which has its headquarters at Ripley Leisure Centre, travel all over the country, taking part in competitions throughout the year. Todd instils in his students the qualities of respect, discipline, integrity, courage and self-belief. To help pay for the trip to Italy, 360 held a sponsored spar-athon, with students, coaches, parents and fighters from other clubs sparring for 100 two-minute rounds each, and raised £1,000.